I’ve seen the inside of a lot of airports lately. Oslo, Copenhagan, Vancouver, Geneva, Bristol, Heathrow, Toronto. In each, I’ve unrolled my yoga mat and done some sun salutations and stretches. I always manage to find a place to practice yoga on airport layovers, but for some reason I feel a bit sheepish doing it. With my yoga mat strapped to my carry-on, I sneak around the terminal hunting for secluded areas and quiet corners. In Copenhagen I found an unused children’s play area. In Oslo I practiced in a vacant hallway between two boarding gates. In Toronto, I stretched out in an abandoned part of the terminal that was under construction. In Heathrow I rolled out my mat behind some unused coin-operated massage chairs. I usually feel self-conscious when I start, but after half an hour of yoga, I feel calm and happy. Also, the addition of inversions such as shoulderstand, headstand or just propping my legs against the wall reduces the inevitable swelling in my feet that occurs on long flights. The benefits of the practice outweigh the concern that I sometimes have about what other travellers think of me, but I do wish that practicing yoga in the airport could be a more socially-acceptable and popular activity. After my most recent journey from Oslo to Geneva, with a four-hour layover in Copenhagen, I googled “airport yoga” and discovered there are several American airports who provide rooms dedicated to practicing yoga! San Francisco International, Dallas/Fort Worth and Chicago O’Hare all have rooms where travelers can take a yoga break. I’m inspired by those airports to continue my habit of unrolling my yoga mat in every airport I find myself in, and hopefully more airports embrace the burgeoning popularity of yoga. After all, there are multi-faith prayer rooms in airports around the world, and exercise in the form of yoga is certainly as important as daily prayer. Yoga deserves the same respect and quiet locale that religious practitioners are already afforded in airports. Hi. 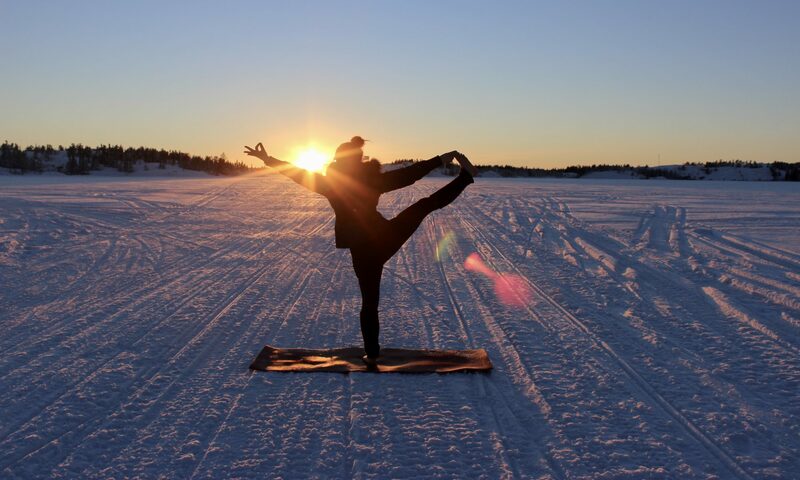 What kind of yoga mat do you bring with you when u travel?